2015 has been the year of the “FANGs.” Investors have fixated on just a handful of glamorous tech stocks – Facebook Inc (NASDAQ:FB), Amazon.com, Inc. (NASDAQ:AMZN), Netflix, Inc. (NASDAQ:NFLX) and Alphabet Inc (NASDAQ:GOOGL) – that have held the broader market afloat even while earnings this year for American stocks have been mostly disappointing and the “average” stock has actually been falling. For lack of anywhere else to go, the investing public is crowding into a very small handful of recognizable names and hoping for the best. Consider the relative performance of the growth and value segments of the S&P 500. (Standard & Poor’s breaks the S&P 500 into two roughly equal halves based on valuation, momentum and other factors.) Year to date through November 12, the S&P 500 Growth index – which includes the FANG stocks — was up 3.9%. Its sister, the S&P 500 Value index was actually down by 5.5%. This is a peculiar market in which cheap stocks are getting cheaper and a handful of extremely expensive names keep getting more expensive. 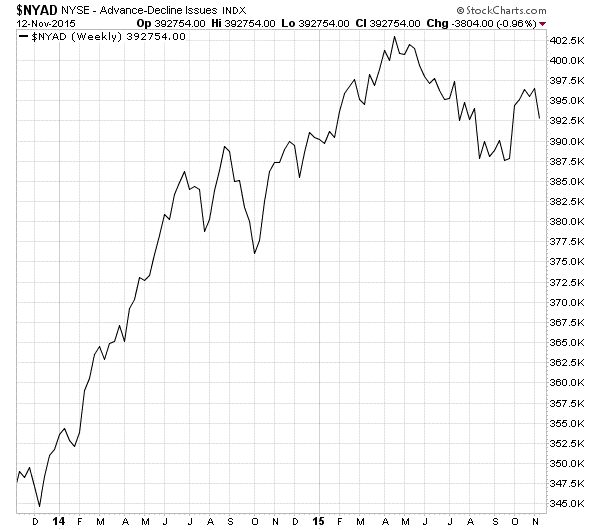 As a case in point, look at the advance-decline line, a simple measure of market breadth. Starting in April, the advance-decline line started to trend downwards and, apart from a brief rally in October, really hasn’t stopped sagging since. This means that fewer and fewer individual stocks are still rising, even while the market grinds slowly higher. In a “healthy” bull market, the advance-decline like rises along with the major stock indexes. So when you see an “unhealthy” market like this, one of two things has to happen. Either investors start to spread their bets across a wider swath of the market and market breadth improves… or they finally throw in the towel and sell the few remaining leaders. So, how on earth are we supposed to invest in a market like this? You really have two options. The first is simply to ride the momentum of some of these glamor names while it lasts. Sure, the FANGs are expensive. But that doesn’t mean they can’t get a lot more expensive in the short term. So, riding the momentum is a perfectly viable strategy so long as you’re ready and willing to sell at the first sign of weakness. The second option, and the one I am following in my Dividend Growth model, is to look for deep values amidst the carnage, or stocks that are already so cheap you don’t mind if they get cheaper. While the S&P 500 Value index is down only 5.5% this year, there are plenty of stocks that are down 30% or more. Several midstream oil and gas pipeline stocks are currently sitting at multi-year lows and are sporting cash distribution yields I never expected to see again. And of course, there is always the third option: Keep a larger percentage than usual of your nest egg out of the stock market altogether and simply wait for better prices across the board. My recommendation? Try some combination of the three. Keep your long-term portfolio heavy in cash and deep-value opportunities, but set a portion of your portfolio aside for more aggressive short-term trading.